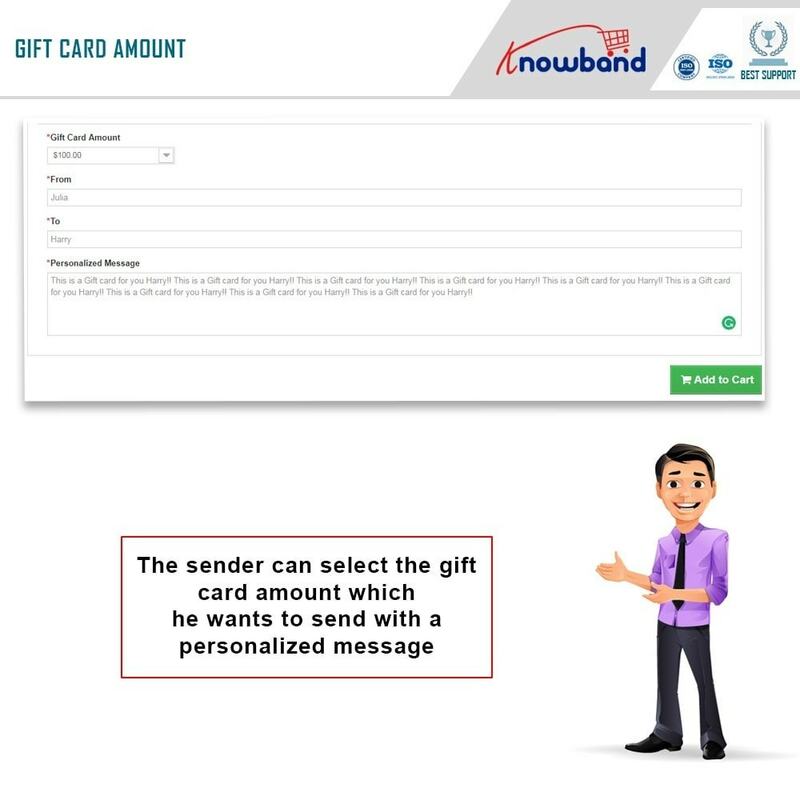 The Digital gift card provides an effortless way to boost the customer base. One of the other advantages of a Gift card is that it has a huge potential of converting the store visitors into paying lead without indulging into the entire conversion funnel. With the help of Prestashop gift card addon, the admin can add the gift card section to their store. 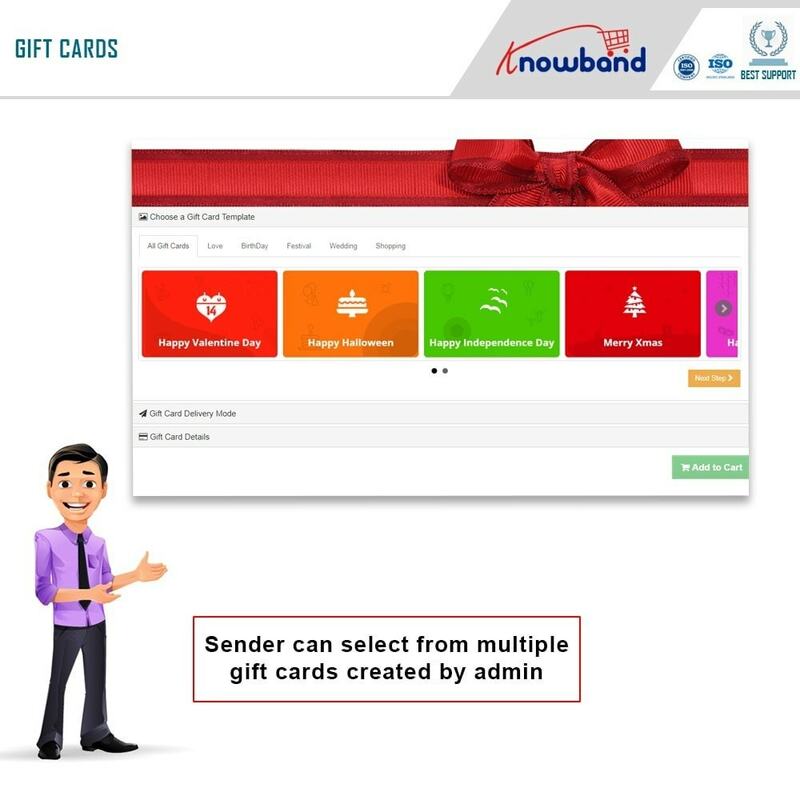 Admin can also create the multiple gift card template for various occasions like Birthday, Anniversary, Friendship day, Father's day and a lot more. 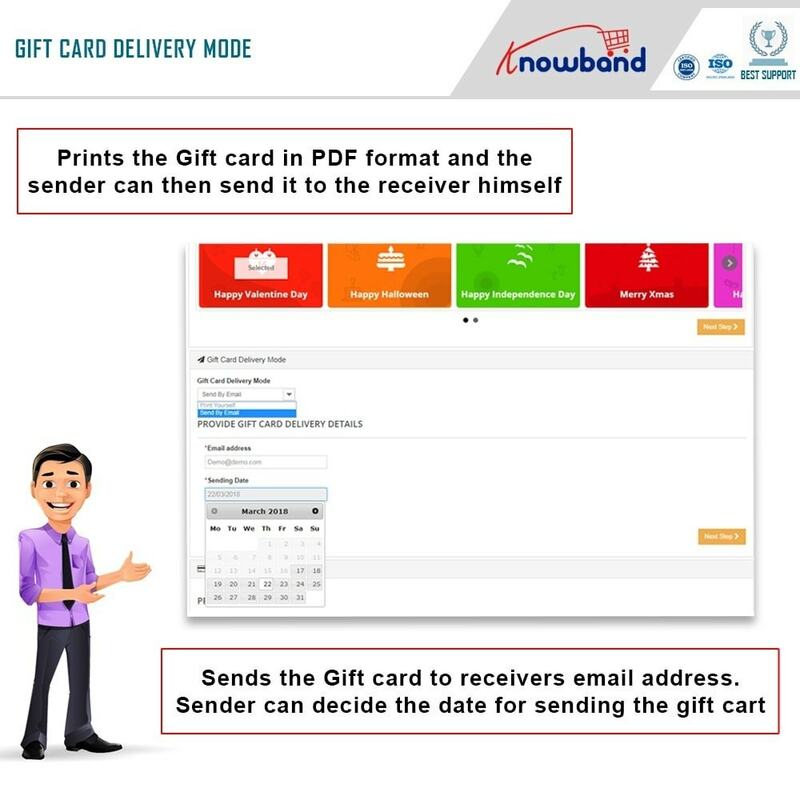 Gift card module allows customers to buy the gift card for special occasions like Anniversary, Birthday, Mother’s day, Christmas and more. The gift card gives the flexibility to the customer. They can use gift card anytime and any kind of purchase. For the customers, Gift Vouchers are the easy gift idea to give to friends and acquaintances. What can you do with this module? Prestashop gift card manager addon adds the gift cards section to the Prestashop store to let customers buy a gift voucher. 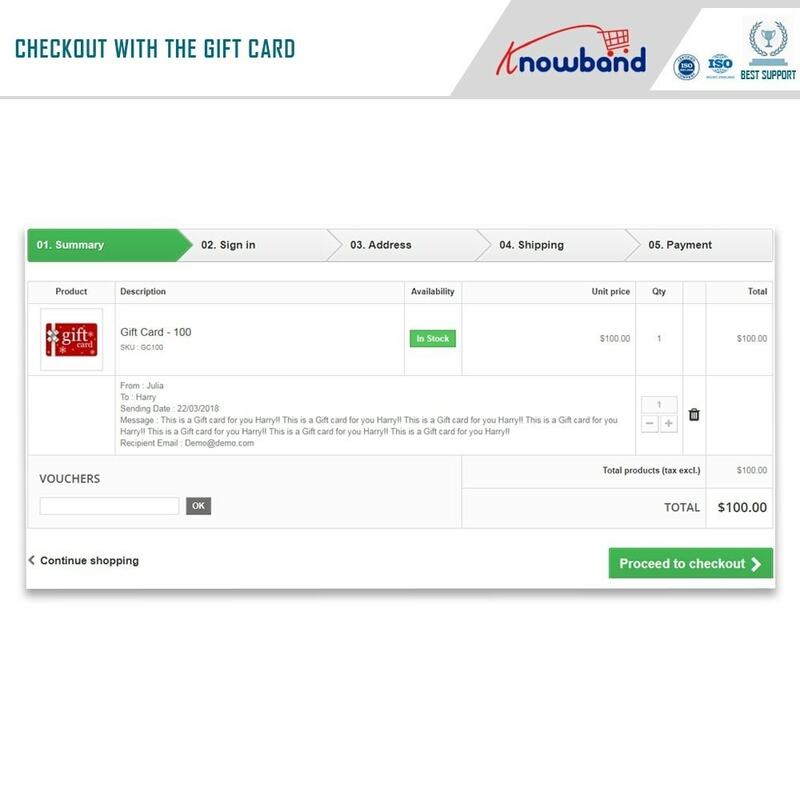 Apart from this, Gift voucher allows the store owner can place the link to the gift card anywhere in the front-end of the website. Prestashop gift module allows the customers to send gift card voucher to their near and dear ones with an ease. 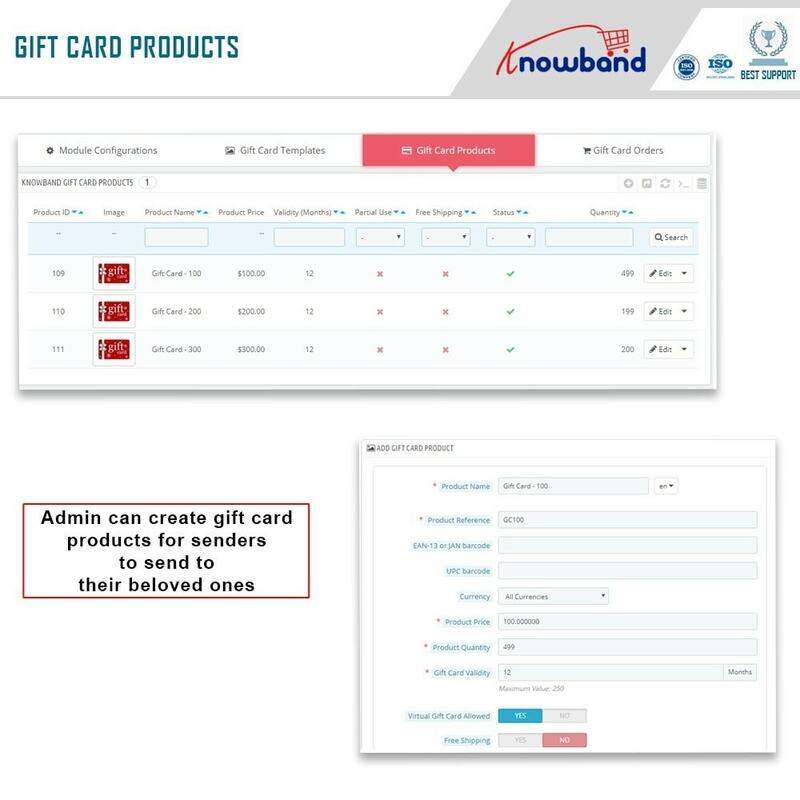 The Prestashop gift card module allows the admin to create gift cards for various events such as birthdays, anniversaries, Christmas and others. 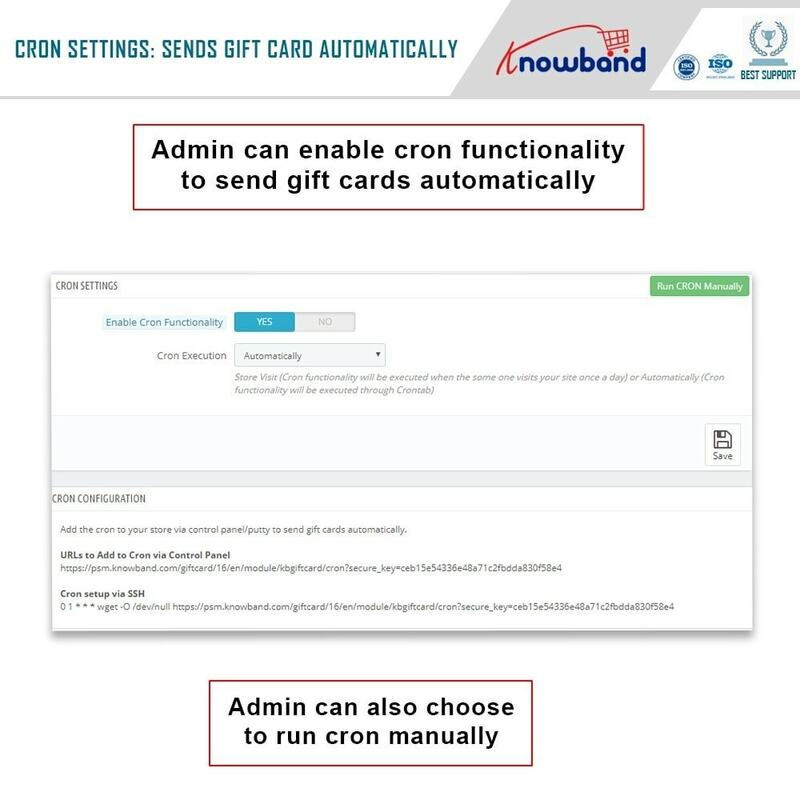 The gift cards and its configuration settings can be managed from the back-end. The admin can set a custom amount or range of the card form the back-end of the Prestashop gift card manager extension. 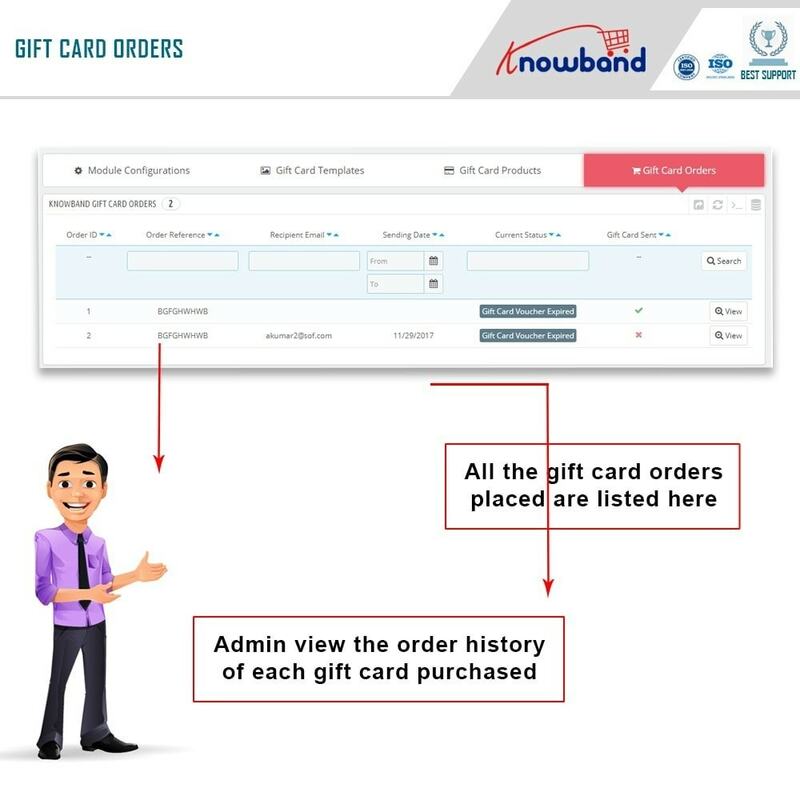 The orders received from the gift cards can be tracked at a button click. The cards are sent to the receivers via emails. By motivating the visitors to make a purchase from the store, the gift card voucher can effortlessly boost the overall revenue. Prestashop send gift card addon provides an option the admin to add the gift card anywhere in the website. The Admin can fix the minimum duration of gift card order place and delivery from the back-office of the Prestashop gift card module. 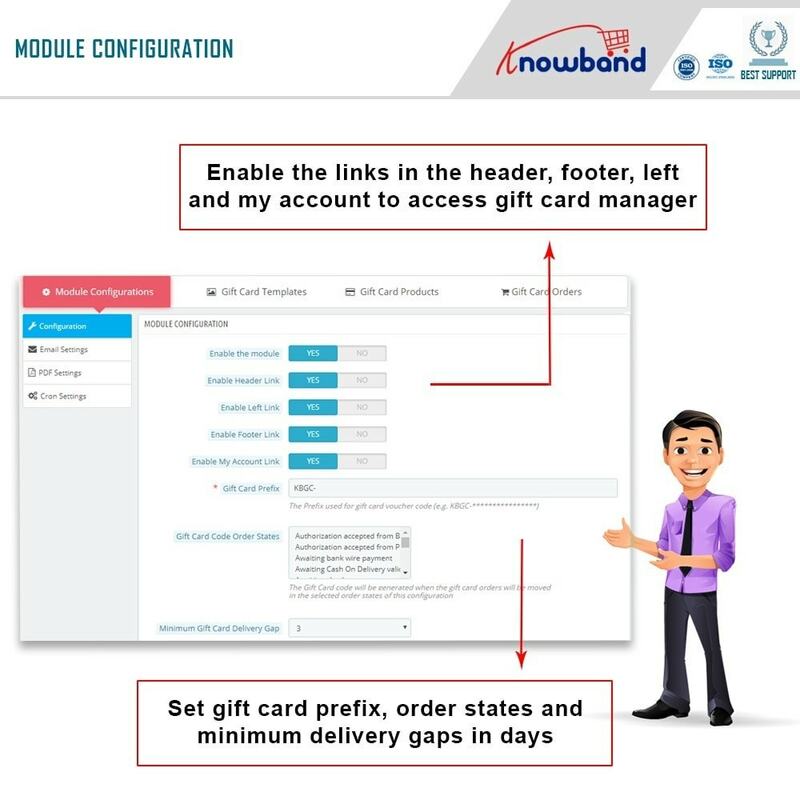 The Prestashop gift voucher module allows the admin to set the terms and conditions of the gift card as well as managed in a matter of moment. Prestashop gift card module offers the ready-made email template which can be customized as per desires. 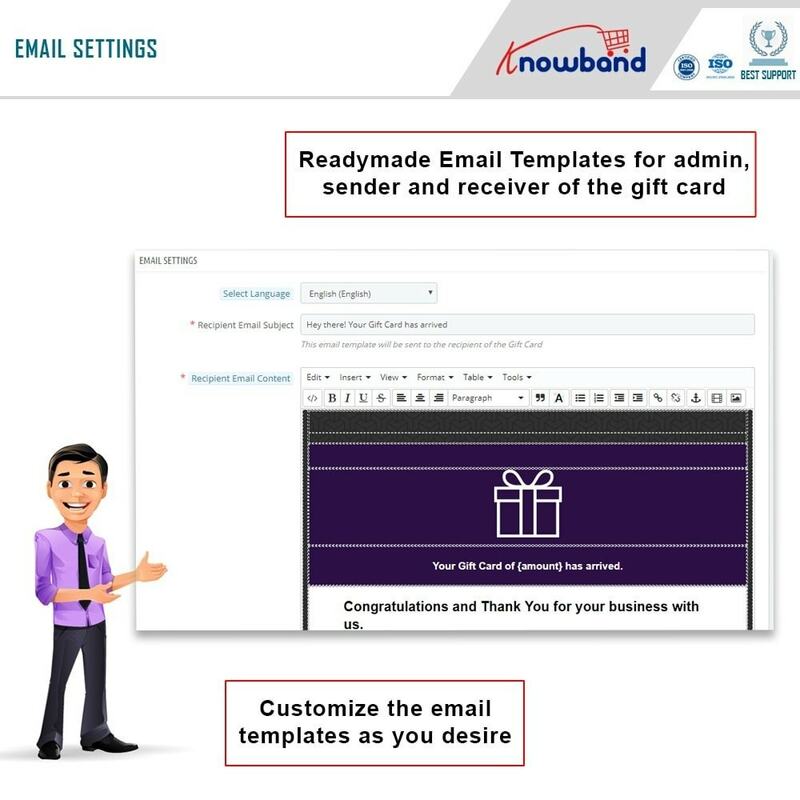 The multi-lingual support allows the admin to customize the voucher cards in multiple languages. The Prestashop gift card addon is compatible with multiple stores. It supports all the Prestashop versions and themes. Prestashop gift card module sends the email with PDF attached. 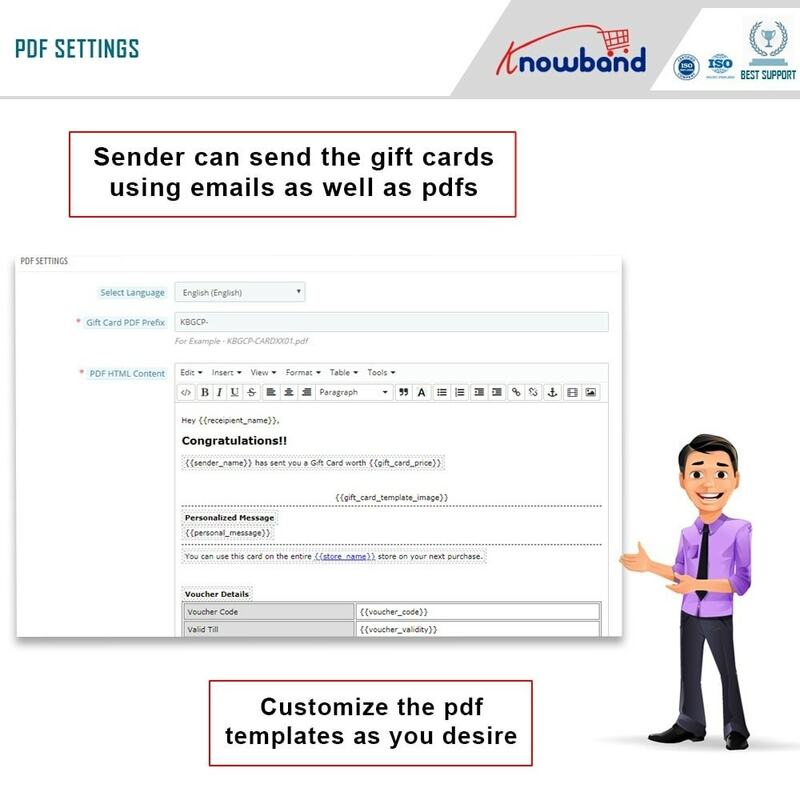 These PDF can be customized form the back-end of the module. 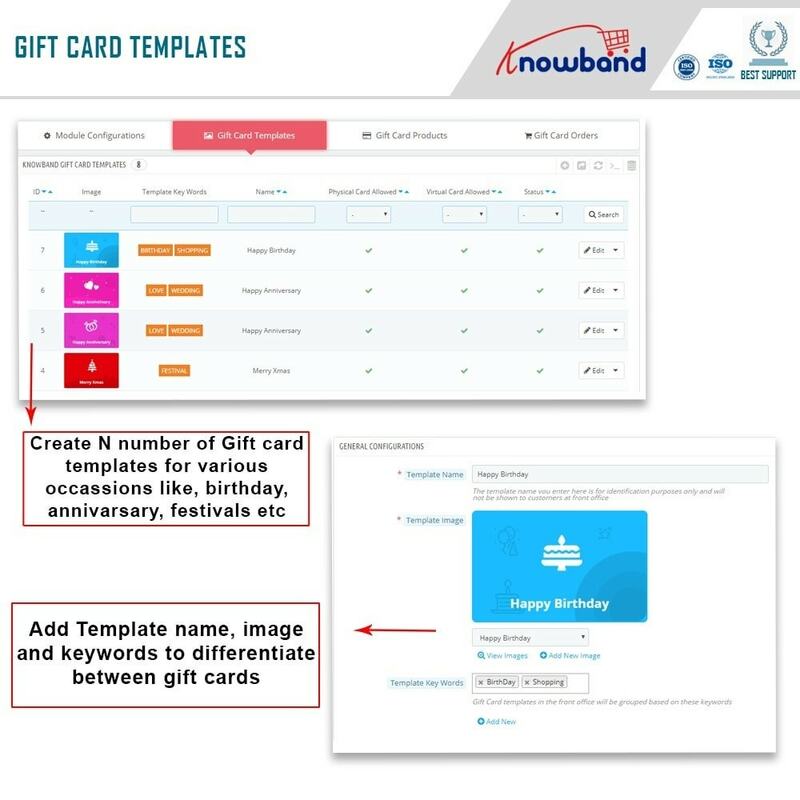 The layout of the gift card templates can be changed and personalized as per the requirement of the e-merchants. The existing templates can be edited or deleted. The card amount, validity period, currency setting, product quantity and other conditions can be fixed by the store owners. The conditions can be enabled, disabled or edited as per the requirement. The admin can allow partial use of the card amount. Prestashop gift voucher addon allows the Online retailer to track the orders for the gift cards from the back-end. The customers get an option to send gift vouchers for every special occasion to their loved ones. This is one of the easiest ways to come to a purchase decision. The simplified transaction makes it easier for the end-users to complete their order from the store.